The full moon rises as the sun sets on the 14th day of the lunar month. A small telescope, such as the 70mm f.8.7 Televue Ranger I’m using for this series of sketches is a perfect instrument for full moon viewing. So are binoculars. The moon is a very generous target, and even the least expensive department store telescope will provide you many hours, days, months and years of inexpensive lunar observing fun! The features you see on the full moon night are so different than the other nights. There are no shadows! So the features which stand out are the more reflective (bright white young craters and their ejecta) or the darker, less reflective mare. Many new lunar observers think the full moon is too bright to view through a telescope. It’s not, but there are some tricks you can use to make your full moon view more enjoyable. One trick I like is to use a higher power eyepiece when viewing the full moon. That higher magnification dims the apparent brightness of the full moon. Another trick is to observe the full moon next to a streetlight or normal outdoor house lighting. We hate those lights when they ruin our dark skies, but they don’t hurt lunar viewing one bit, in fact they improve it! I don’t like to use moon filters or neutral density or polarizing filters when observing the moon. They diminish the sharpness of the features I want to view. There are so many features I can identify on these sketches, but I’ll just mention the ones I have not covered before. My center sketch seems to be a little better than the “final” lower one. I can see, in addition to the great rayed craters Copernicus, Tycho and Kepler, lots of small bright white craters or ejecta. Proclus and Messier are near Mare Crisium, but it will take a map for you to find them. Proclus is a crater that is actually visible to the unaided eye at full moon, but I didn’t capture it on my sketch very well, probably because I made this sketch after midnight on a mid-week work night! Your sketches are much better than mine, Jane. While I haven’t tried your trick of viewing the Moon near a streetlight I can attest to using higher power to dim the image. In fact, to improve on that idea you should try using binoviewers – two eyed views of the moon are absolutely amazing! Thanks – for this project I am using a “galileo” like telescopes. No binoviewers in those days. I use my Zeiss Binoviewer and Zeiss Abbe Orthos and my Astrophysics f/9 AP180 refractor for binoviewer sketches for over 10 years now. 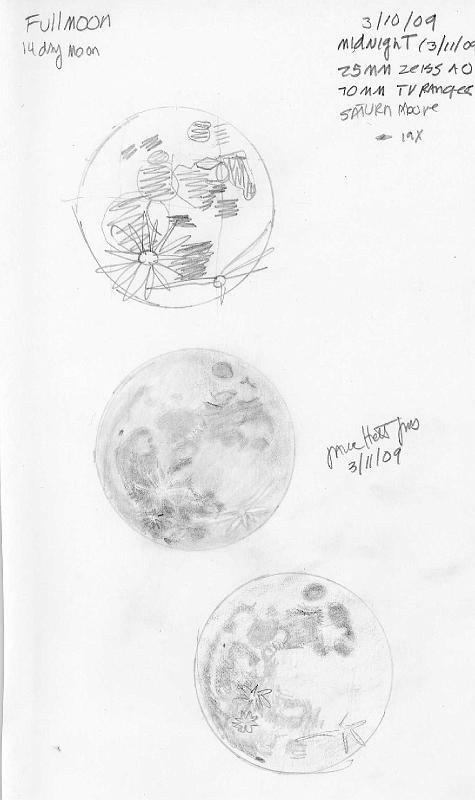 I have a different sketch page – this blog is just my 2009 Galileo project.